Well, in actual fact we're not going to mention Easter again at all this post - not once; sorry... PS This may not be true; but we're just not a very Easter-celebrating blog. Have a nice time if you are, though. First up, here are some of the podcasts that we've just released! Next up - Nick and I are back together for another musical episode - this time we're looking at the big hits of 1980 in the UK and USA. SHY'S YETI SUPER TROUPERS OF 1980!! Here we are for episode 244! Paul and Nick discuss the big hits of 1980 and also jump a few years forward to compare two of the biggest bands of the late 1980s who are still around making new music in 2019! We also ask Wifey Jo and Calum what their favourite singles by these bands are! Our next episode, #245 sees Cuthbert discovering an app related to fellow podcast, The Smellcast; which all seems very exciting until it has a very odd affect on him. Do join us, won't you?! Please email me at shyyeti@yahoo.co.uk if you have any comments - you can even send me a sound-file and I'll include it on the show. The music is by Shy Yeti and Luca. All content of this episode is Copyright Paul Chandler, 2019. Episode 244 was recorded between the 20th and 23rd February 2019. A BAD CASE OF THE PICKLE HOLLOWS! Here we are for episode 245! Cuthbert accidentally downloads a free Pickle Hollow app whilst downloading old episodes of The Smellcast and although it starts off kinda cute it soon gets scary as Cuthbert finds himself losing control! How do they delete the app? Can Toppie Smellie help them out?! Our next episode, #246 sees us heading back onto Pride48 for our April 2019 LIVE show! Do join us, won't you?! Please email me at shyyeti@yahoo.co.uk if you have any comments - you can even send me a sound-file and I'll include it on the show. The music is by Shy Yeti, Harry F and Luca. Sound effects by Paul Chandler and Soundbible. All content of this episode is Copyright Paul Chandler. This episode was recorded on the 6th of April 2019, with additional messages recorded on the 17th April 2019. The video of this episode can also be viewed on our MRSHYYETI Youtube page! Check it out! We also have a Sutton Park clip from December 1995 (#1140-1141) and some further recordings from the archives recorded for the show back in autumn 2018. Don't forget to check out The Smellcast - available on all pod-catchers; thanks again to Toppie for all his help! Our next episode is our LIVE Pride48 show for April 2019 - it didn't quite go to plan! Here we are for episode 246! 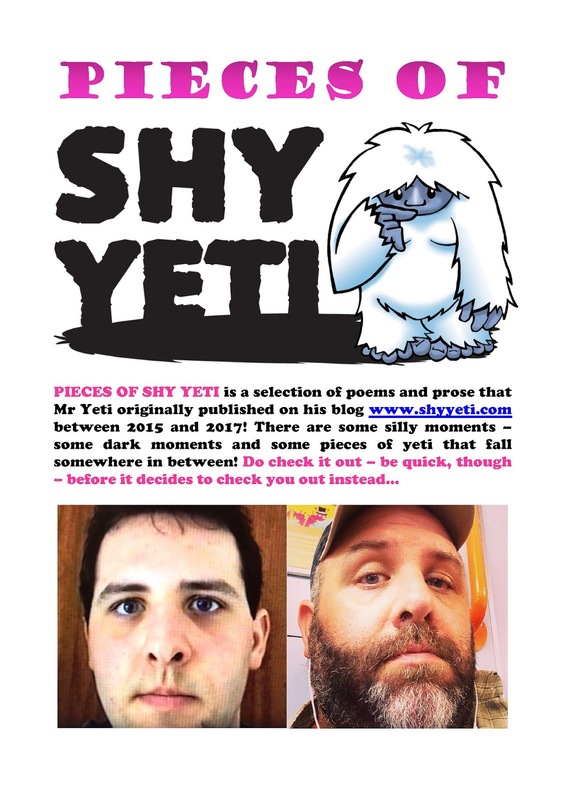 It is Easter Sunday and Paul is about to launch his new book, PIECES OF SHY YETI on lulu.com and Amazon, with help from all those in the chat-room! Only there is a hiccup with Pride48 which threatens to cancel the whole show!! But never fear - for Shy Yeti and his friends do NOT give up and instead they jump onto Skype to discuss Easter and all manner of sillinesses instead! Thanks to Andrew and Lisa from Round The Archives and Toppie Smellie from The Smellcast for saving the day! We also have Easter-themed, chocolate-tasting EXTRA material!! Why not have a listen!? Our next episode, #247 sees old friend of the show Harry F calling up Paul with a very special request... it involves him singing again... on a big stage! But will Paul be well enough to perform!?! Do join us, won't you?! Please email me at shyyeti@yahoo.co.uk if you have any comments - you can even send me a sound-file and I'll include it. The music is by Shy Yeti and Luca. Sound effects by Paul Chandler and Soundbible. All content of this episode is Copyright Paul Chandler, 2019, except for the clips from Big Fatty Online (Episodes 2926-2928) which share copyright with Big Fatty, 2019. Episode 246 was recorded on Sunday 21st April 2019. P.S. By the way - here are more Sutton Park episodes from my Youtube channel (MRSHYYETI); both from Autumn 1993. 247. The Day Shy Yeti Lost His Voice! 248. Out On The Town On A Work Night! Paul takes the listeners out for a night on the town with an old friend of the show - but what kind of madness will they get up to!? 249. Shy Yeti's New Assistant! Paul feels abandoned by the regulars - but Cuthbert has a brainwave to get him some help to manage his work-load. What he doesn't expect is that this help may come in the form of a robot called Rob. Mr Yeti celebrates 3 years of the show in our live Pride48 show for May 2019! 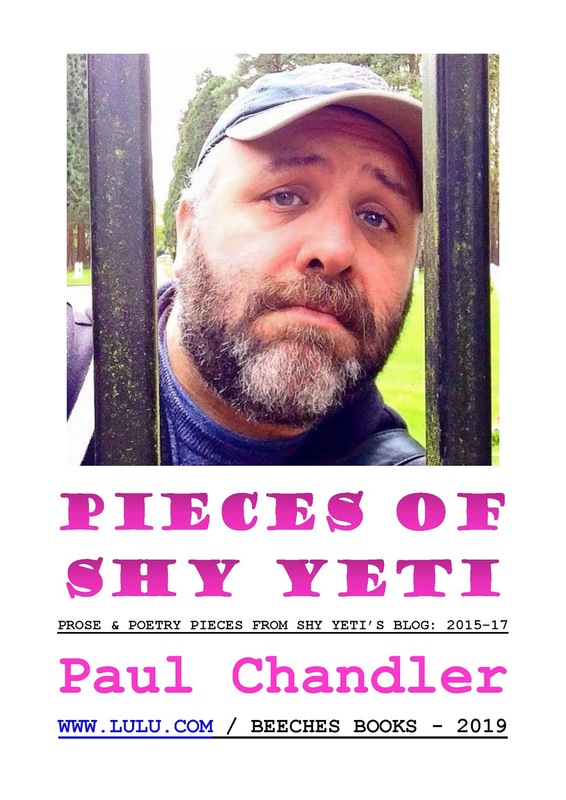 There will also be some readings from Paul's new book, PIECES OF SHY YETI. 255. Shy Yeti Is Making His Mind Up! 257. Charlie Grrr and The Pie With The Pastry Plumage! Paul catches up with Cromitty and Martin and is excited to learn that Cuthbert has a few added advances that makes it possible to re-connect with the past via old episodes of SUTTON PARK... Ikk is slightly doubtful about it all - but he and Paul soon get to experience the process first-hand. Unfortunately his upgrade also unearths the control of a certain app that was once installed on him! Shy Yeti gets more than he expects when he receives a visit from Isaac and Declan from That's A Shame podcast - they are constantly on the lookout for Shame sources - but this time they have Paul in their sights! This post and its contents are Copyright Paul Chandler, 2019 - except for the above illustration by Martin AW Holmes which was made to advertise Round The Archives in Spring 2019. Copyright Martin AW Holmes, 2019.